It was yet another day at the Ark for the Mechanical Maniacs as they woke up and switched on the TV to see what was on. Magnetman: Hey I was watching that. Topman: Come on! It's a fun day why don't we all go outside and so something. Needlegal: Well he does have a point. All we've been doing lately is sit around and watch TV. Geminiman: And your point is? Needlegal: My point is that we've become a bunch of slobs that sit here and do nothing. At this rate I'll have to use my old Transmetal armor. Geminiman: Ah yes, the cannonball outfit. The jokes we made. Needlegal: *pounds Geminiman's head in* Shut up! Shadowman: Well we got nothing better to do. Sparkman: But what about all the cleaning that needs to be done? We have to make this place nice and sparkling clean. Snakeman: Who put extra sugar in Sparkman's coffee? Topman: Well at least he's cheerful. Why don't we leave him to clean? He seems to want to. Magnetman: What about Hardman? All he does is sleep and drink beer. Hardman: *mumbling* Thank you sir, may I have another! Geminiman: Well I'm sure as hell not waking him up. Topman: Last time I tried he hit me through a wall. Needlegal: Yeah, it took us forever to fix all the damage. Shadowman: We might as well leave him here as well. Topman: So we're off to town! The Mechanical Maniacs walk off and leave Sparkman and Hardman behind. Meanwhile at the Photosphere, the Quarter Knights discuss plans. Zeikfried: What a pathetic race of people. We could easily wipe them all out. Alhazad: But those pesky robots defeated us so easily. Lady Harken: Well at least it they made Belselk shut his mouth about how great he is. Belselk: How could I lose! I never lose! I'm the strongest of all demons! I can never lose! Especially to a stupid drunk robot! Lady Harken: *sighs* Perhaps I spoke too soon. Zeikfried: Yes, those Mechanical Maniacs may prove to be a threat. But everything has its weakness. If we can expose it they will fall before us. Alhazad: Yes, patience my pet. This world will be ours for the taking. Lady Harken: Stop calling me a pet! Alhazad: I'll call you pet whenever I want! My pet! Lady Harken: *slaps Alhazad and storms out of the room* The nerve of that bloated devil! Alhazad: Don't make me get the whip! Zeikfried: Why did I have to bring these idiots with me? Belselk: How could I have lost! Lurking in the shadows, a ninja listens to the Quarter Knight's discussion. Ninja: So there is a group of people who managed to defeat the mighty Belselk. Maybe there is hope for this world after all. The ninja disappears and not far from where he was standing Zed was listening. Zed: That ninja thinks he can gain all the glory? I'll show him a thing or two. So Zed follows suit and disappears. While in town the Mechanical Maniacs walk around. Shadowman: Seems that no one is around. I wonder why? Magnetman: Maybe it has something to do with the random beatings on the news. Shadowman: Makes sense. But who could be behind them? Topman: Maybe it's those guys the Quarter Knights. The Maniacs pause for a while then suddenly burst out in laughter. Shadowman: Those guys? I highly doubt it. Snakeman: Yeah, they come in and say I'm here to wipe out your population and take over the world. And they only have 4 people. Magnetman: And that Zed guy. Needlegal: You mean the guy you broke his sword on Hardman? The Maniacs continue to laugh more. Geminiman: Like he has the strength to beat up anyone. Topman: But seriously, who else could it be? Geminiman: Well it certainly isn't Wily. It's just not his style. Shadowman: And the Decepticons would have some sort of reason for attacking. 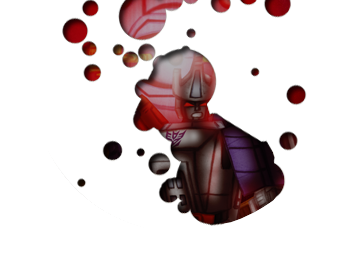 But even if they did they don't have Galvatron. Snakeman: What about Bizarro Shadowman? Suddenly Bizarro Shadowman crashes into a building. Bizarro Shadowman: Really weak! Me not in any pain. Snakeman: I guess that knocks him out. A ninja appears on the roof of another building and laughs at Bizarro Shadowman. Ninja: That is the great Shadowman? Ha! And you call yourself a ninja. Shadowman: Don't know but if someone could defeat Bizarro Shadowman that easily we had better run. Needlegal: Running away from a battle bro? That's so unlike you. Geminiman: Well if you think about it. Bizarro Shadowman is probably our strongest opponent. We've only managed to defeat him using our brainpower. Now if you saw someone absolutely flatten him would you want to stick around? Needlegal: Still, it's so unlike you bro. Shadowman: Hey, I like fighting the odd bad guy. But I know when I'm beat so why don't we call it a day before he sees us. Ninja: Hey you down there! Topman: Looks like he saw us. Ninja: You must be the Mechanical Maniacs. Ninja: I am Boomerang, Demon Ninja and Assassin! Magnetman: Boomerang? What kind of name is that? A boomerang flies out and hits Magnetman in the head. Boomerang: Do not mock me Magnet head. Geminiman: He must the one behind the random beatings. Boomerang: So you know about me wimp with crystals on his armor. Topman: Of course we know about you. They've been talking about you on the news. Boomerang: So the toy can talk. Shadowman: Ok enough with the names. What are you doing here? Boomerang: I seek a worthy challenge. I have heard you defeated the mighty Belselk. Needlegal: You're with the Quarter Knights. Boomerang: Do not associate me with those losers little girl. I am much more skilled than they are. Snakeman: He shouldn't be much of a challenge if he's with those losers. Geminiman: Did you not just see him knock Bizarro Shadowman into that building? Geminiman: Yeah, the Bizarro version of Shadowman. Extremely powerful, a little dumb and has a speech impediment. Boomerang: So he is not Shadowman? Shadowman: What? Gem! Why did you just do that? Geminiman: I was bored standing here talking so I thought a ninja fight should make things interesting. Shadowman: Fine. But don't think you won't pay. Boomerang: So you are Shadowman? Boomerang: Then I challenge you to a duel! Shadowman: A duel? Isn't that kinda old fashioned? Boomerang: Well there is no other form of combat that I know of that we can do. Shadowman: Then how about a contest on projectile throwing? Geminiman: And I was hoping there would be a good fight. The Mechanical Maniacs and Boomerang head over to a targeting range and Shadowman then tells Boomerang the goal of the task. Shadowman: Three disks will shoot out of the walls. Your task is to hit all three before they land. The fastest will win. Boomerang: Ha! The task is all too easy. I'll even give you the first shot. Shadowman: Ok then. Release the disks! Needlegal launches the three disks into the air and Shadowman fires 3 Shadow Blades simultaneously and all 3 hit their targets. Boomerang: Impressive. But watch this. Needlegal launches another 3 disks and Boomerang throws his Saber Fang at the disks. They are perfectly lined up to get hit in one shot but unknown to Boomerang, Shadowman pushes a button to make the disks drop and Boomerang's Saber Fang misses all 3 completely. Boomerang: What! How could I have missed? Shadowman: Looks like I'm the better ninja. Boomerang: I think you cheated! Shadowman: Me? Cheat? I would never do such a thing. Topman: Right. We all believe you. Boomerang: I know you cheated and I demand we have a real fight! Shadowman: Why a fight? Can't we just? The Saber Fang hits Shadowman in the head and returns to Boomerang. Shadowman: Ow! Now you've done it. Boomerang: Really? Bring it on! Shadowman throws 3 shadow blades at Boomerang but he just fades out and moves away from them. Boomerang: You'll have to be faster than that. Shadowman then jumps over Boomerang and does his slide attack knocking him off his feet, then jumps in the air and throws another 3 shadow blades at Boomerang. Shadowman: No one ever hits me. Boomerang: We'll see about that. Boomerang lands and knocks the 3 shadow blades away and then kicks off a wall and strikes Shadowman with the Saber Fang. Shadowman appears from the rafters and jumps to the ground. Shadowman summons his frog into battle and attempts to burn Boomerang. Geminiman: It's about time they fought. This whole day was getting boring. Needlegal: Enough puns. Let's go help. Boomerang: *throws the Saber Fang at the Mechanical Maniacs* This is between ninjas! Shadowman and Boomerang continue fighting while Zed is hiding watching the battle. Zed: This is great. Once Boomerang defeats Shadowman I will step in and take them all by surprise. I'll surely become a Quarter Knight after that. After a while Boomerang catches Shadowman off guard and hits him. Boomerang: Ha! You were a tough opponent. But still not good enough prepare to die Shadowman! Using Zed's appearance to his advantage, Shadowman teleports away from Boomerang's attack and knocks Zed into it. Boomerang: Damn it! I had him! Shadowman: And you were so close too. Shadowman appears behind Boomerang and kicks him down to the ground defeating him. Shadowman: Looks like I won this battle. Boomerang: This is your fault Zed! I will see to it that Zeikfried hears of this. Zed: My fault? You attacked me when I tried to fight them when I dressed up as Bizarro Shadowman. Zed: I learned everything about your villains and discovered that Bizarro Shadowman was indeed one of your most powerful enemies. So I disguised myself as him in an attempt to scare you all. Then I would destroy all of you. And I would have succeeded had Boomerang not attacked me. Magnetman: Yeah, like that one was going to work. Shadowman: We don't fear Bizarro Shadowman. We would have just tricked you into destroying yourself. Zed begins to throw a fit until Boomerang knocks him out. Boomerang: You may have won this time Shadowman. But rest assured, I will return. And next time I won't be so easy on you. Boomerang teleports out with Zed. Topman: Well that solves the mystery of the random beatings. Let's all go home. The Mechanical Maniacs arrive home at the Ark to find it glowing in brightness. Sparkman: I cleaned the base just as you asked. Now it's all sparking clean! Hardman: What the?? I've gone blind! No! I knew I shouldn't have drunken so many beers! Hardman runs around and crashes into Teletran One. Sparkman: Hey! I just cleaned! Sparkman chases Hardman around the base making an even bigger mess. Snakeman: Hmm? I guess everything turned all right. Sparkman: No! You're ruining my work! Get back here! Needlegal: Yeah and we learned something too. Sparkman: I spent so long cleaning this place! Shadowman: Excuse me I think I'll go shut them up. Needlegal: Well we learned that you should never add more sugar in Sparkman's coffee. It can only lead to disaster. Hardman: My eyes! I can't see! Shadowman: All of you shut up! Topman: Well until we can actually get this place cleaned up we are? The Mechanical Maniacs!